The ATR 72-500 has its idiosyncrasies. In the cockpit is a “seat position sight gauge", which are three small, coloured balls that allow a pilot to adjust his viewpoint to a position that ATR deems appropriate, allowing for a “correct view of instrument panels as well as runway environment". 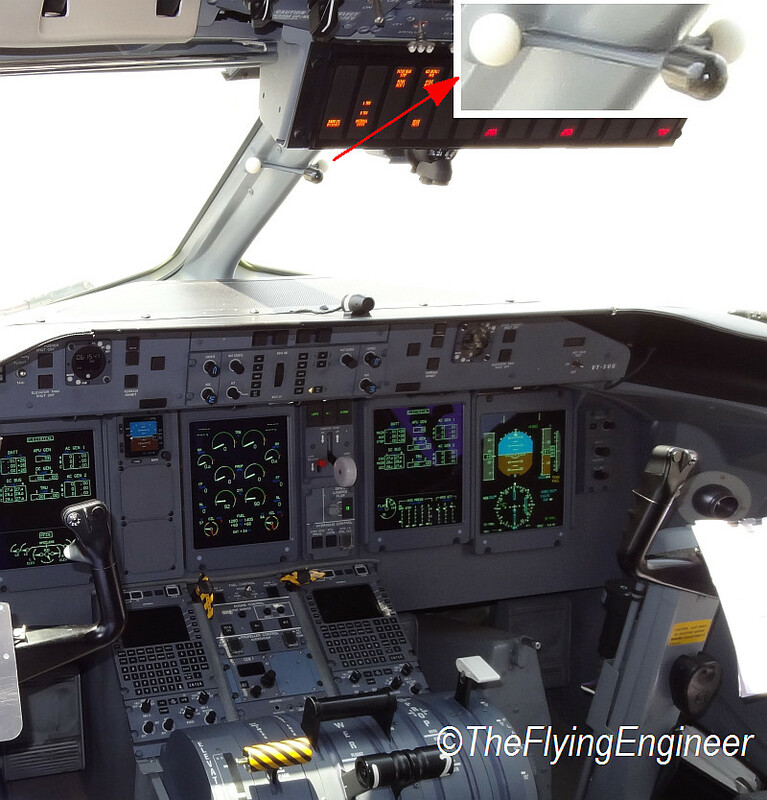 The photo above shows the ATR 72 cockpit, with the sight gauge enlarged in the inset. 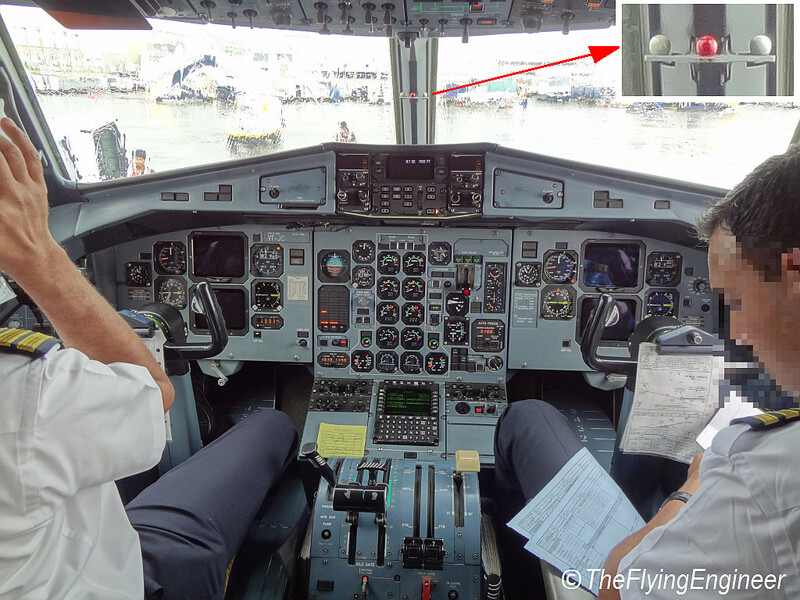 If the first officer is to have his viewpoint right, he must adjust his seat height and position such that when looking at the three balls, the left white ball is obscured by the red centre ball. Interestingly, this gauge is not found in the Boeings, where the recommended method of adjusting the viewpoint is different. The ATR 72-500/600’s competitor, the Q400, however, has something similar, called the “eye level indicator", as may be seen in the second photo. The Airbuses, not surprisingly, have a sight gauge similar to that found on the ATR. With the eyes adjusted, the view is good, and clean. But with the ATR 72, (and the Q400) one has to be very careful with the flare: the airplane’s fuselage is long and low, and a tail strike is easy. Another complication is the aircraft itself: having a constant speed propeller means that when you pull back on the power levers, the pitch angle of the propeller blades changes to “fine" (almost perpendicular to the direction of the airplane’s travel through the air), resulting in a significant increase in drag. If the flare is more than required, and the airplane balloons*, pulling back on the power levers is the last thing one would want to do, as the drag would make the aircraft drop to the runway like a stone! So one would add power to keep the airplane up, and this will eat up more runway: Messy indeed. And for him, with the ATR recommended viewpoint, comes the tendency to flare more than required. On 9th May, 2004, N438AT, an ATR 72-212, during the approach to landing, the captain stated to the first officer (flying), “you better keep that nose down or get some power up because you’re gonna balloon.". After the airplane crossed the runway threshold, the captain stated, “power in a little bit, don’t pull the nose up, don’t pull the nose up." The captain then stated, “you’re ballooning,". The airplane touched down with a vertical load of 1.3G, bounced into the air, touched down a second time, then bounced into the air with a nose up of 9°, climbed to 37 feet, and touched down a third time with a vertical load of 5Gs. After a fourth touchdown, the badly damaged airplane came to a stop outside the runway. And yes, I have also heard some of my friends say, “Oh damn, I forgot to flare!" Hi Vasuki, Question, do you know what other planes had the 3 ball seat position indicator? I flew a sim for an airline pre-hire checkride once that had it but can’t remember which plane it was. Can tell you that it was identical to what’s in the ATR 72-500 from your article. Thought that it was either a 727 or a 707 but I went on line looking at cockpit photos and that doesn’t appear to have been it? So any guesses? All Airbuses do! You may have flown an A300 / 310. Douglas jets (including the McDonnell) don’t seem to have eye levellers.